All too often a dog’s destructive behavior is cause for a return to the shelter. It can even result in unspeakable things like animal abuse. At the very least, it causes stress in your household and puts a strain on your relationship with your pet. 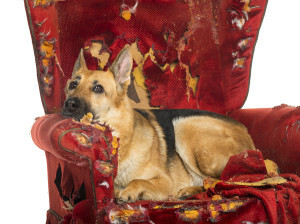 Let’s for a moment, take a walk in our dog’s paws to try to understand what could cause your beloved pet to behave so unspeakably as to destroy your favorite chair, sunglasses or pair of shoes… perhaps the paneling on the wall? Dogs are smart creatures. They are living, breathing animals with active bodies and minds. When you leave your dog for eight hours or more a day, to go to work, your dog sleeps, right? And when you sleep, your dog sleeps, right? That’s a lot of sleep. One might even hazard a thought that your dog might get bored with 16 hours of sleep time a day. And when the dog gets bored, your favorite chair looks like a pretty enticing chew toy. What can we do so our dogs are not bored? Don’t tune me out, please – I am serious! And what can we do to minimize the destruction that can happen in our homes? Take your dog for walks every day or several times a week. Being outdoors stimulates your dog’s powerful sense of smell, exposes her to new sights and sounds. She might meet some new people or dogs. Here’s a kicker – you might, too! Dogs are a great ice-breaker to meet the neighbors. The exercise will do you both a great deal of good. If you or your dog is not in shape, you soon will be. Your dog may save you the cost of a gym membership. Your dog may walk off some needed pounds, too. 2. Take your dog to an off leash dog park. If you are lucky enough to have an off leash dog park nearby and your dog gets along with other dogs, this can be a great way for them to blow off steam and make new dog and people friends. The parks are fenced in areas where dogs can run off leash and play with other dogs. Be mindful and watch your dog at all times; not all dogs get along and they can get into fights. Once you start going regularly, your dog will have pals he can rely on for good, clean, energetic (did I say tiring?) fun. 3. Go hiking! Discover your local park system with your furry friend. Many of us have beautiful local parks and green spaces that are set aside for hiking, biking, walking, camping, etc. Leash up your furry friend and explore together! I was amazed when I discovered the local gems scattered around New Jersey. 4. Take your dog to doggie day care or schedule a play date with another dog. Doggie day care is a wonderful thing! While you are at work, your dog plays in a supervised setting with other dogs – all day long. Of course it comes at a cost, but if you sign up for packages it is usually pretty reasonable. Your dog will be tired and happy when you pick him up. You don’t have to take your dog every day – once or twice a week will do wonders for his happiness and yours. Dogs make friends easily. You can also invite another dog owner and dog over to play at your home. The dogs can tire each other out while you make a new friend, too. 5. Take a trip to your local pet store! Most pet shops allow dogs to shop along with you. After all, you need dog food and treats and other fun things for your pets – you are going there anyway. It’s a great opportunity to socialize your dog and give him an outing that is not to the vet or groomer – something just for fun, just for his pleasure. And it usually involves a car ride which most dogs love. With what joy will he realize that there are cookies at the checkout counter…. He’ll be dragging you into the store next time you go! 6. Consider a second dog if you only have one. Okay, I said consider it. I know it isn’t often possible. We had one dog for most of our lives – three is new, believe me! But I do think that having a canine friend in the house to keep him company, adds to your dog’s quality of life and contentment. It can lessen the possibility for destruction and help to tire them both out, because you know they play at least a little while you are out! (We are soon installing a doggie cam to see just what does happen when we leave… I’ll report on the findings when we do.) Also for some dogs who have separation anxiety, like our Lobo and our old girl Shelby, the anxiety can magically melt away when they have another dog to keep them company. Okay, so that gives you some ideas for tiring your dog out and expanding his mental horizons. A tired, happy dog, is less likely to chew on your slippers. Now what about dog proofing your home while you are out, just in case Fido is tempted to chew on your favorite something or other while you are away? 7. Keep your dog in a small part of your home when you leave. Close doors to the bathroom and bedrooms. Maybe put a doggy gate or two up to close off hallways or stairways. We keep our three dogs confined to the living room and kitchen while we are out. They have access to the water bowl and a big window to watch the outside world go by. 8. Remove all possible sources of temptation. We move couch pillows to another room when we go out. This as the result of a pillow “explosion” that happened a long time ago… it’s amazing how many feathers there are in a single pillow when the dog tears it apart. The same goes for remote controls and magazines – we tuck them away in a drawer when we leave the house. If your dog is limited to one area, simply remove all the unnecessary items (eye glasses, mail, shoes, clothing, keys) to higher counters, into drawers or to other rooms. Paper is like candy to our Lobo, so all paper goods are safely stowed away. 9. Apply ‘Bitter Apple’ spray to areas you think might be chewed upon. Bitter Apple spray is available in most pet stores. Dogs hate the taste. When we got new couches, we sprayed the corners after Secret chewed on one of them. They were never touched again. I even tried spraying Fiona’s tail (oh dear, Secret likes to grab it) but it didn’t work! So I wouldn’t advise spraying it on other animals… But couches, wooden molding, Christmas tree branches, etc. Just check the manufacturer’s instructions before applying. 10. Give your dog a window to look out upon his world. Dogs love to be on guard, to watch what is going on in the neighborhood, to be the first to see you when you pull into your driveway. It makes their lives interesting and feeds into their natural instincts to be aware of their surroundings. If at all possible, give your dogs a window on the world to look out while you are away. It also gives you the added gift of seeing them waiting eagerly for you when you get home! I hope you find some of these tips useful. You may want to consult with an animal trainer or behaviorist for support; some cases are more difficult, especially in a rescue situation where a dog’s past is not known and can affect current behavior adversely for reasons you cannot fathom. If only dogs could talk!! We have to learn to speak their language as much as possible. Enjoy every day with your sweet pups!! Please let us know if you have any questions or feedback – we love to hear from you!